Hearthstone is adding new Legendary weapons with the upcoming Kobolds & Catacombs expansion. This is a major addition to the game, so Shacknews is breaking these down individually, continuing with the Druid. Today, we take a look at the Druid, a third class that isn't usually seen wielding weaponry, unless it's from Medivh, the Guardian. But this weapon is about helping Druid do what it does best. Most Druid players know how to do one thing above all else: Ramp up before the opponent. That's what Twig of the World Tree does... on paper. But that 5 durability seems like a bit of a sticking point. By the time it runs out, the Druid will usually have 10 mana crystals anyway. But that's the beauty of the Deathrattle. Unlike Innervate, these are not empty Mana Crystals. So that makes this less Innervate and more Kun the Forgotten King. And that makes the possibilities with this weapon very interesting. As mentioned, the idea isn't so much to get to 10 mana quickly, as much as it is to refresh those 10 mana. 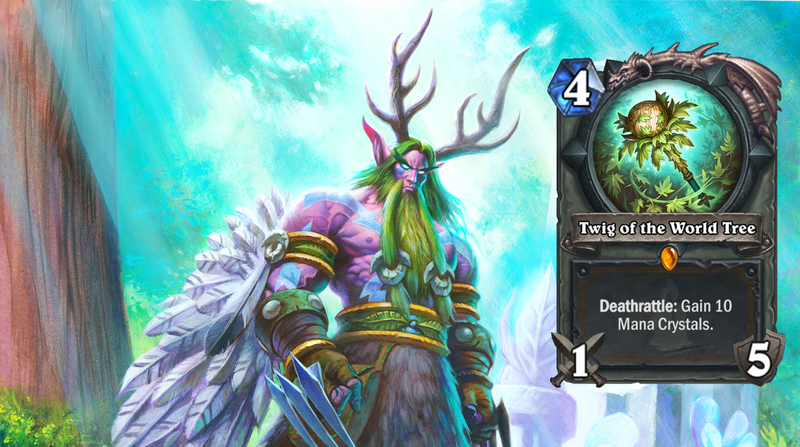 That makes Ramp Druid/Jade Druid a particularly attractive deck to slot this Twig of the World Tree into. The easiest combination for this weapon is to just use Medivh, the Guardian on Turn 8. With the weapon Deathrattle giving the Druid player 10 fresh mana crystals, Medivh essentially becomes a free play. And on top of that, with Atiesh now equipped, players can then proceed to drop Ultimate Infestation to get its insane rewards and a random 10-mana minion. All of this, mind you, can come in one single turn! And that's not even raising the possibility of playing Kun the Forgotten King, too! That is just plain disgusting! 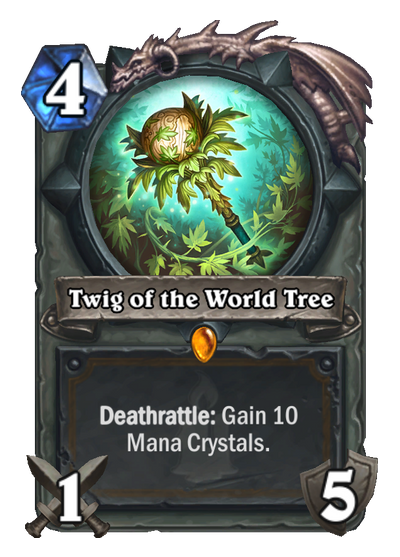 Assuming that's not the Druid player's route, there are a multitude of decks that can utilize Twig of the World Tree. Jade Druids can use something like Gadgetzan Auctioneer to cycle through their cards before deploying the weapon Deathrattle to get another shot at cycling through cards and deploying Jade Golems. If you're ramping up, Twig of the World Tree will be a must-have. However, if you're the type of Druid player that likes to move fast, the weapon might be a little too slow. Aggro Druids will likely stick to their current lane, using low costs minions with stat-boosting spells. Quest Druids, similarly, won't have much use for the 10 mana boost when the idea is to discount their minions. 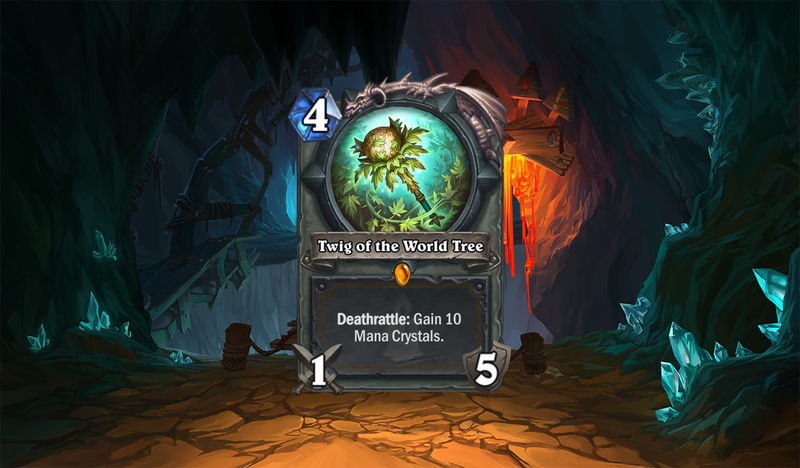 Twig of the World Tree won't be for everyone, but it's certain to make a lot of Druid players very happy. There are still six more weapons to break down and Shacknews will be here to analyze them over the coming weeks. Kobolds & Catacombs is set to hit Hearthstone on December 7. I think this card only makes sense in big druid, which tends to not do a lot on turn 4 anyway. There's a lot of dead mana in the early turns. So really great in that archetype, mediocre to bad in all the others. Innervate gives a full mana crystal for one turn only. You probably meant to put wild growth there. Why are the decks that are already good getting more broken tools? I guess psychic scream is meant to replace dragon potion which rotates out next year, but adding it now makes puts priest in its own tier.